Curt Jepson was standing on a ladder in his protective suit attempting to remove a hive from beneath the eaves of a local church when the risks of his profession nearly stung him in the face. Hundreds of honeybees swarmed over Jepson’s coveralls as he began to remove the honeycombs. Jepson wore a hat and a veil, which he attached to his coveralls with a zipper. Unfortunately, that evening he had forgotten to zip part of the veil shut. “My white coveralls were just black with bees,” he recalled. “And all of a sudden, one crawled across my face inside my veil, and then another one and another one; and pretty soon my whole veil was full of bees. Jepson said he climbed down from the ladder and walked around the parking lot for at least a half hour while carefully brushing the bees off his coveralls. “I couldn’t take off my veil to get at those on my face because I still had hundreds of them all over my coveralls,” Jepson explained. After he had cleaned the bees off his suit, Jepson slipped off his veil and shook out the remaining bees. “It was a tragedy narrowly averted. “I didn’t even get stung,” Jepson said. “I was very lucky. That incident occurred about four years ago, the year Jepson decided to get into the business of exterminating bees, hornets, and wasps. Although Jepson said he probably gets stung at least a dozen times a year, he is very careful now about zipping his veil. Jepson, 46, who was a friend of Gov. Tommy Thompson during their high school years in Elroy, moved to Milwaukee in 1966 after he got out of the Army. 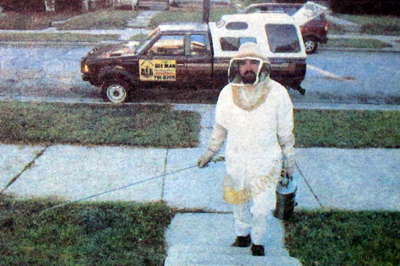 Jepson operates his business, called The Bee Man, out of his Brookfield home at 4615 N. l50th St. He said he was first attracted to the world of stinging insects by his brother, Chris, who is a beekeeper. Jepson started making money in the business after a trade journal led him to Vespa Labs, a Pennsylvania firm that offered to pay money for wasps. Jepson said the company offered about $550 for a pound of frozen wasps. The firm uses wasp venom to make medication for people with allergies. “I wrote the company and they gave me a contract to supply them with frozen wasps,” Jepson said. “I’d go out at night and remove nests that were in trees or hanging on the sides of houses. Jepson said he collected more than 300 nests in 1980, his first and most successful year inthe business. Jepson said that, on average, it takes about 10 nests to get 1 pound of wasps. But as the economy went sour in the early 1980s, so did Jepson’s wasp collection business. The orders from the lab began to dry up, and in 1984 Jepson decided to set up an extermination business on his own. 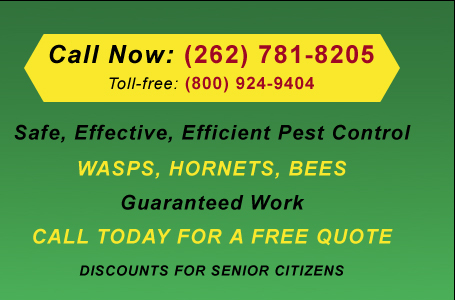 Although local pest control companies provide some competition for his business, Jepson said most of the firms do not have the same level of experience in handling stinging insects that The Bee Man offers. Michael Wojciechowski, maintenance supervisor for the Greendale School District, said that for the past three years the district has used The Bee Man exclusively for its stinging insect problems. “Whenever there is a problem, we give him a call, Wojciechowski said. “Over the summer we probably use him on average about five times. Jepson said he is licensed by both the state and city to do insect extermination, but stressed that he does not use any restricted chemicals. The Bee Man charges about $40 to $65 per service call, depending on the distance Jepson has to travel and the size of the job. In cases where honeybees have become a nuisance, Jepson said he typically tries to remove the hive or will call another beekeeper who is interested in removing the hive for his own use. William Eisner Sr., president of William Eisner & Associates Inc., a Hales Corners public relations firm, said that in 1987 The Bee Man attempted to remove a hive of honeybees from an office wall at his firm at 5307 S. 92nd St.
“We have an upper deck, and we use it for entertaining clients for lunch and for the employees,” Eisner said. “The bees got so bad that we had to abandon the deck. Eisner said Jepson made four or five trips to the office in an attempt to save the bees. But he eventually had to exterminate them. Jepson said his business has grown by about 50 percent since l986. 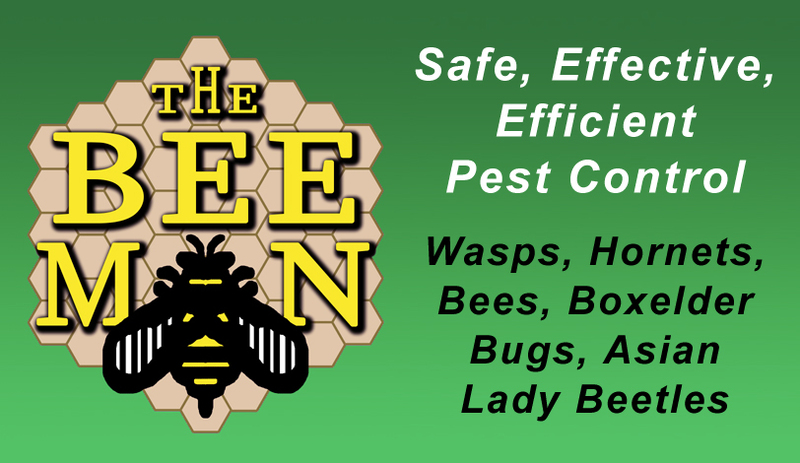 The Bee Man recently expanded its service area to Kenosha, Racine, and Madison. Jepson said that on a busy day, he gets many as eight service calls. He said The Bee Man employs two other people on a part-time basis as well as his daughter, Leah, who runs the office during the summer. Jepson said the business is dormant during the winter when the insects go into hibernation, but between April and Nov. 30 it is open for business every weeknight and weekend. Jepson said he does not believe in exterminating stinging insects if they are in their natural habitat. But, he said when a bee takes up residence in or near a dwelling, it becomes a pest. Once that happens, The Bee Man is called in to bring the vermin to justice so that the common person can once again enjoy the peace and comfort of his home.